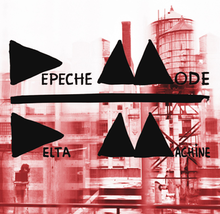 Depeche Mode has progressively become more esoteric with each new release over the past decade, and Delta Machine, the pioneers of synthpop’s thirteenth effort, is no exception. The set opens with raised expectations (“Welcome to my world/Step right through the door/Leave your tranquilizers at home/You don’t need them anymore”), but Martin Gore’s lyrics (with occasional help from lead singer Dave Gahan) quickly tap his usual arsenal’s vein of longing, lust, and guilt, albeit this time with an ostensibly more reflective slant. Production duties are again bestowed upon Ben Hillier (Blur, Doves), although this is reportedly the final installment in his Depeche Mode trilogy. While the album’s somber lead-off single “Heaven” is more of the same of what we have come to expect from DM of late, the synth-heavy moodiness of Delta Machine, more times than not, ends up sounding like the soundtrack underscoring a melancholic indie film. With only rare and occasional dashes of delight (the upbeat “Soft Touch / Raw Nerve” and “Soothe My Soul”) in an otherwise underwhelming set, we can only guess Gore and Gahan have become self-satisfied in regards to Depeche Mode’s musical mythology. Perhaps it’s time for Alan Wilder’s long awaited return to offer some much needed perspective? Those envisioning a return to form like the band’s glory days of Black Celebration, Music for the Masses, or Violator, will ultimately be disappointed, but Depeche diehards who are willing to settle for an updated A Broken Frame or Exciter will revel in Delta Machine’s austerity. It’s hard to imagine anyone other than extreme DM reactionaries finding anything here essential besides the abovementioned tracks, the stirring “Secret To the End,” and the mid-tempo “Broken.” We can only hope this isn’t the way Depeche Mode intends to end its legacy.